Driving past the Seventh-day Adventist church in Surrey, BC my friend Martin glanced at the parking lot and saw an elderly lady changing the outdoor church sign. What I now believe to have been divine providence, Martin turned into the church parking lot and began a conversation with the lady that ended up with my friend leaving with a few VHS tapes by Walter Veith and Kenneth Cox. Bringing them next week to our round-table home fellowship group we decided to watch one of the videos. The rest they say is history. The videos by Walter Veith produced by Amazing Discoveries allowed me to see that the spiritualism that I had been in previously was totally against the Bible record and the truth that Jesus was the the only way for salvation became crystal clear. The videos opened the book of Revelation to me and gave me an understanding of the beasts in Revelation as well as the Mark of the Beast. I became a Seventh-day Adventist in 2004. The now “Total Onslaught” series is the newer version of the same series that I had watched that helped me to trust in the Word of God more than the secular belief the world was promoting. I am truly indebted to the work that Walter Veith and his team have done in spreading the truth by showing the deceptions of the world. Looking back and thinking about the old VHS tape series in green, I don’t remember ever hearing Walter Veith teach the Trinity doctrine on those recordings. Recently coming into the truth about Jesus being the true Son of God I was curious to know what Walter Veith had to say about the trinity and the 3-in-1 and 1-in-3 “mystery of God”. I had the privilege of talking to Walter Veith many years ago and I remember him quizzing me on certain subjects. He asked me what I knew about Futurism and Preterism. Let me tell you, I didn’t know much. He asked me about other subjects and I then had personal experience that Dr. Veith is truly a teacher at heart. Even a one on one encounter with me gave me a sense that Walter really cared about teaching the truth. I respect Walter Veith and pray that many more people may come out of the deceptions of the world and into the truth that Jesus Christ is the only way to salvation. Fast forward 11 years of being a member of the Seventh-day Adventist church and I recently have come to the truth about God. I have found out that our Pioneers of the Adventist church truly believed something different than the current Seventh-day Adventist doctrine of the Godhead. I have found that there were deceptions in our church and changing of books to harmonize more with Evangelicals in the teaching of the trinity. If I had Walter Veith’s phone number I would like to call him and sincerely ask him what he believes about the trinity doctrine of our church that has slowly crept in shortly after the death of Ellen White. I would like to hear him confidently proclaim the truth that Jesus is the true Son of God and explain to me that God is not a 3-in-1 and a 1-in-3 God. With confidence I would like to hear him say that Jesus truly is the begotten Son of God and explain to me what the word begotten truly means. I would like to ask him to do a video presentation such as the documentary I recently watched entitled Theos: The Begotten Belief. Amazing Discoveries removed this video on the Trinity and was entitled “Can You Explain The Trinity / Bible Answers – Victor Gill. 2.) 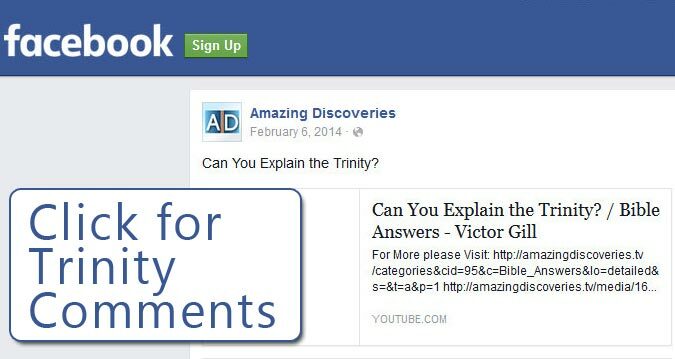 Amazing Discoveries posted the Bible question about the Trinity to Facebook on February 6, 2014 and there was much feedback from it’s followers. The comments were for 6 days until February 12, 2014, 11:48am before they stopped all of a sudden. In total there were thirty two comments with some people commenting more than once. The question about the Trinity doctrine is a great question to ask. Why go silent? Why is there no Total Onslaught video on the trinity? John 17:3 And this is life eternal, that they might know thee the only true God, and Jesus Christ, whom thou hast sent. It’s definitely an important subject if eternal life is based on knowing the Father and the Son. Amazing Discoveries Answers If The Trinity Is Pagan? 3.) 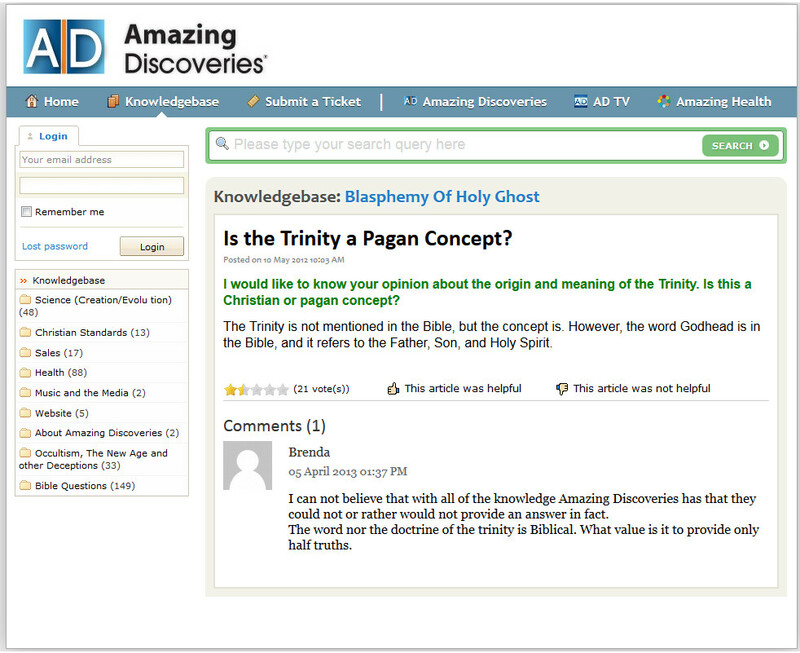 On May 10, 2012 a question was posted and answered on the Amazing Discoveries Knowledgebase (a question and answer site) asking “Is the Trinity a Pagan Concept?” The answer by Amazing Discoveries was: “The Trinity is not mentioned in the Bible, but the concept is. However, the word Godhead is in the Bible, and it refers to the Father, Son, and Holy Spirit.” I’m hoping they will remove this answer shortly like they did for the YouTube video because the topic deserves more than two sentences and they do not provide any evidence unlike the strong evidence found in other Bible topics they share. Notice the comment in the picture below in regards to the answer AD has provided. This article has nothing to do with Amazing Discoveries belief and they did not create this article. They are only passing the information along. I found the complete article on another website and am placing it below for your interest because it highlights the direction we are heading when we don’t believe in the literal relationship of the Father and the Son. Note how these Bible translations that remove the “Son of God” could actually be more in favour of the Trinity doctrine because many pastors and theologians are re-defining the “Son of God” to mean someone completely different than the only begotten Son of God. These translations from my viewpoint are taking out the filial language of the Bible and the strong inference of the Father and Son relationship. In my understanding Dr. Rodríguez is saying not all of the Catholic church doctrines are evil. The Catholic church is NOT going to do away with Christ (Christological statements) in the Bible because they also believe in the trinity. My response to this observation would be that by our church believing in the trinity doctrine we are already taking away the Son of God. In other words the Protestant Seventh-day Adventist mind does not seem to realize that in accepting the Bible and believing in the doctrine of the trinity, they are accepting the authority of the spokesman for the church, the Pope. A.) It’s a Biblical principle. B.) We need to pray and help the people who are preaching God’s Word by searching the scriptures ready to give an answer. If we see error we need to be willing to talk about it. Amazing Discoveries exposes deceptions and I am looking forward to that day by the grace of God when Amazing Discoveries records a powerful presentation against the trinity doctrine and comes back to the plain teaching of the Seventh-day Adventist church. Walter Veith. Please put me on the pre-order list for this Anti-Trinitarian video. I will wait patiently. Thank you for bringing me into this end-time message through your videos. May the Lord bless you and your wife. Continue to press on in spite of all the opposition around you. Dear Reader, please pray for the teacher that was influential in bringing me to an understanding of the times we are living in. Thank you. It has been brought to my attention that in this article I may be egging on Amazing Discoveries to talk about the truth about God almost to the point of attacking them. Am I doing this? After reading the article again I see that I am “egging on” (inciting to action; stir up; spur on; urge on) Amazing Discoveries. I am hoping to raise awareness of the Trinity doctrine deception. I personally know people that are strong supporters of Amazing Discoveries and when I talk with them regarding the Trinity teaching they are trusting in the Amazing Discoveries organization for guidance. People are not seeing and judging for themselves. Seemingly strong truth seekers do not want to put the Trinity doctrine on the table for examination because they are trusting in ministries like Amazing Facts, Secrets Unsealed and Lightbearers. If friends of mine are yielding up their judgment to religious teachers then it makes sense to me to begin talking about what these teachers are saying on the subject of the Trinity and expose the false theories that my friends are accepting. I am not attacking Amazing Discoveries. The organization has helped me but I hope no one will trust in any organization to the point of not comparing the messages brought to them with what is recorded in the Bible. I write because I have a desire to share. It is born out of a desire to understand. I wanted to know also what Dr. Veith believed about the Trinity. I must ask, does not John claim Jesus to be Yahweh in John 12:38-41? That the saying of Esaias the prophet might be fulfilled, which he spake, Lord, who hath believed our report? and to whom hath the arm of the Lord been revealed? Therefore they could not believe, because that Esaias said again, He hath blinded their eyes, and hardened their heart; that they should not see with their eyes, nor understand with their heart, and be converted, and I should heal them. These things said Esaias, when he saw his glory, and spake of him. In the year that king Uzziah died I saw also the Lord sitting upon a throne, high and lifted up, and his train filled the temple. Above it stood the seraphims: each one had six wings; with twain he covered his face, and with twain he covered his feet, and with twain he did fly. And one cried unto another, and said, Holy, holy, holy, is the LORD of hosts: the whole earth is full of his glory. And the posts of the door moved at the voice of him that cried, and the house was filled with smoke. Then said I, Woe is me! for I am undone; because I am a man of unclean lips, and I dwell in the midst of a people of unclean lips: for mine eyes have seen the King, the LORD of hosts. The Bible certainly calls Jesus Yehovah but please do not jump to the conclusion that this proves that God is a Trinity. These texts do not give any proof that there is one God: Father, Son, and Holy Spirit, a unity of three coeternal Persons. The Bible uplifts one God who is the Father and one Lord Jesus Christ who is the Son of God. Jesus is called Jehovah because He is the express image of the Father’s person. Perhaps a few quotes from E.J. Waggoner’s excellent book “Christ and His Righteousness” will help in understanding how Jesus can be called Jehovah. Thanks for your question. Hope that helps. hi brother, greetings in the Name of Our LORD JESUS CHRIST. Just to inform you that we already have a powerful and total onslaught video on the doctrine of the trinity by the Revelation1412.org team! the champions of TRUTH are Imad Awde and Nader Mansour. 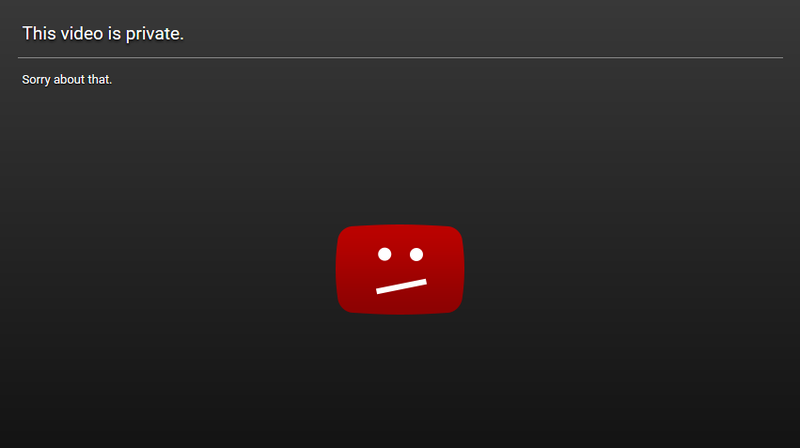 please subscribe to these videos on YouTube. I was just curious if you ever got an answer back from Brother Walter as to whether or not he supported the anti-trintitarian belief. I have just come this truth of the God head and I am so shocked that I have been lied to all my life about this matter. Walter has some really great videos and I don’t want to cast him aside as a false teacher if it isn’t true. Please let me know if you find out anything!!! Thank you and please keep me and my family in your prayers. We are all on the journey to discover more truth and learn what it is that God wants for us to know. May God continue to bless you as well. As of October 30th, 2016 we have not heard any new information that Walter Veith or Amazing Discoveries are talking about the Trinity doctrine. Thank you for your comment and we really appreciate your short testimony about coming to the truth about God. Walter Veith’s video series were personally an integral part of my conversion experience and I am thankful for his dedication and ministry. We need to pray for Walter that God may give him strength and wisdom to see the wonderful truth that God truly does have a Son. Prayer is needed also for the countless people that have come to the Bible through Walter Veith’s messages to have the courage to keep moving forward even if Walter Veith decides to remain silent about the Trinity doctrine. God bless you sister as you and your family continue your Christian walk now knowing the truth about God. We will pray for you. i MYSELF HAVE GROWN MUCH WITH WALTERS TEACHINGS AND WITH NADER MANSOUR WHO HAS SHOWN ME THE TRUTH OF THE FALSE TRINITY. I Also have been trying to get in touch with Walter Vieth, but for reasons other than the Trinity. Another Youtuber just happened to mention the Trinity ? in relation to Walters beliefs, Well after a few exchanges he sent me this and suggested listening to the first few minutes…. Thank you for your email. I do wonder what Walter Veith’s thought would be on Ron Wyatt’s findings. The Red Sea Crossing presentation by Ron Wyatt was one of the main videos that encouraged me to come back to the Bible. I hope many people will take the time to watch the presentations. Please let me know what you think, I myself have been deceived many times in my life, often by those who have been deceived themselves. Personally the Trinity makes no sense to me, but that will not stop me from sharing what I’ve learned from Walter. I’ll continue to follow and Discern for myself what he has to share. Thanks for the comment. You have reminded me of 1 Thessalonians 5:21 – Prove all things; hold fast that which is good. In Russia there is a revival and struggle for truth. People present a lot of evidence against the teachings of the Bible from the Bible, as well as from the Spirit of Prophecy. I point out that our pioneers did not believe in the doctrine of the trinity but fought the doctrine for the rest of their lives. Greetings from Czech Republic. Just cling to the original word, and we shall also receive life as Christ Jesus received Life! Why debate that which is already established? What if we would start at Genesis 1 and 2? In creating human beeing : in Gods imadge and likenes… So how does it come to be that human beeing, made of man and women (she is taken from him) are one – one human beeing, being able to reproduse and bear children. In this picture we could see God being One – God Father, and Holy Spirit (taken from God Father) at the same time being a separat personality and at the same time One God, with begoten Son Jesus – God Jesus, for how can he be anything else then the One from whome he comes. I see more and more clearely when trying to understand bouth positions of trinitarians and antitrinitarians, basicly because this isue is not moving anywhere as the discusion allways ends up with bouth camps beeing wrighte confirming tbemselves by bible and Elem White. This idea came to me after reading G.R. Knight book “I was perfect” where he defines how at the same time salvation and sanctification are the things hapening at the moment as well as happening through our whole life. To add to this i was loking to the hebr. word Spirit – and it is female word as well as in lithuanian language wich has the oldest origin among living languages. It was allways a big chalange to me to understand why God has created woman if all in Godhed are men, that has ben a shoking expirience to me to hear for the first time in the church that Holy spirit is He. Sincerely. Walter Veith does support the trinity. His organization has put out a Jesuit inspired video by Joel Kratzke who is a handler and a Catolic sympathizer. It was very clear after contacting Amazing Discoveries that what we believe in of no importance to them. They have no leg to stand on. When the real important subjects hit the fan you will see those who have made vast inroads into Adventism lead the masses into the wide gate to perdition. 1. When God said “let US create,” were there “two gods”? NO. One God, united of three Persons. 2. When Paul said there is “one God” = the Father, and “one Lord” = Jesus Christ, Is the Father no longer Lord? and is Jesus no longer God? NO. Jesus and the Father are ‘One’. When you worship, or see Jesus, you also do it for the Father. When you glorify the Father, you glorify Jesus. When you say one God, the Father, you mentioned Jesus; When you say one Lord, Jesus Christ, you mentioned the Father. 3. Jesus IS God, no doubt. To separate Jesus and the Father, means you’re creating ‘two’ gods, therefore violate God’s law.